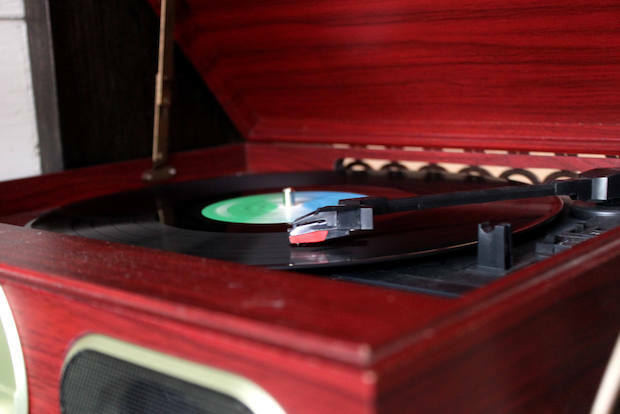 COBBLE HILL — Step into the past — and bring your records. Bar-goers can play their own vinyl records at Congress Bar, a retro neighborhood tavern at 208 Court St. built in what was once an old-fashioned Court Street vegetable shop. A Studebaker wooden turntable sits on the bar alongside a small collection of records, and patrons are welcome to play any genre of music on it, bartender Nevada Caldwell said. “For me, it exposes me to music that I might not have heard otherwise,” Caldwell said. In December, the 600-square-foot space that used to be Jim & Andy, a 1970’s veggie shop that closed last year, reopened as a tavern serving locally distilled spirits, beers and $10 cocktails, plus a menu of Bloody Marys on the weekends with flavors like beef jerky, Sriracha and Caesar, which is based on a Caesar salad recipe. Other spirits are priced between $8 to $12, with more expensive single-malt whiskeys, cognac and mezcal. Owner Toly Dubinsky said he hoped to retain the old look and feel of the grocery store, including restoring its hardwood floors and keeping the shop's original sign. The grocery was a neighborhood staple for many Italian families in Cobble Hill and Carroll Gardens, Dubinsky told DNAinfo New York last year. Congress Bar is “not pretentious but it makes really good cocktails,” as Caldwell described it. If bar-goers don’t have their own records to play, they can choose from those the bar has on hand by Otis Redding, Bob Dylan and jazz musician Oliver Jackson Haywood Henry. “They get to hear what makes them happy when they’re drinking Bloody Marys,” Caldwell said.